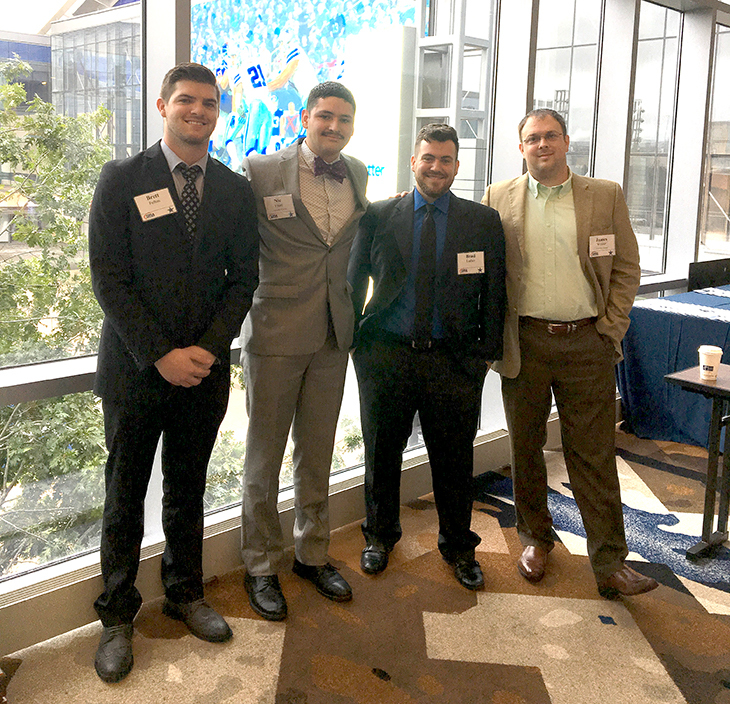 James Weiner, assistant professor of sport management, was at the Sport Marketing Association (SMA) annual conference Oct. 24–26 in Dallas with a group of three UT juniors, Nic Freiri, Brett Felton and Brad Luther. They were all there to network, but also to compete in the Case Study Bowl for undergraduates. 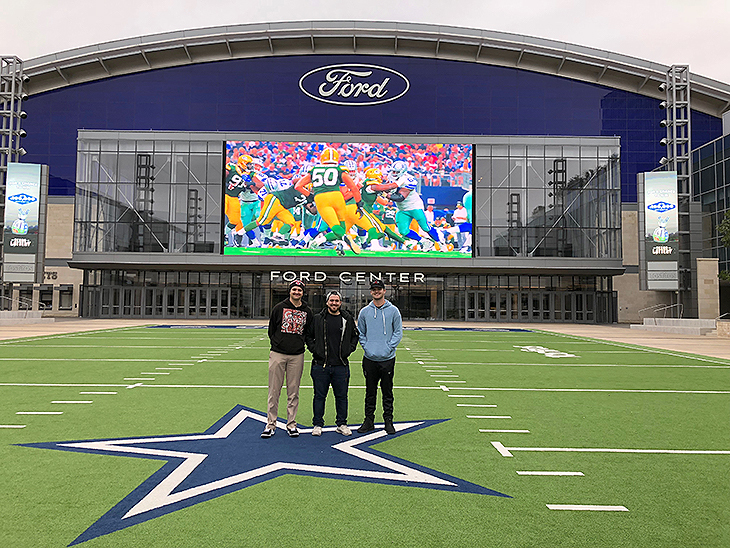 Brett Felton ’19, Nic Freiri ’20 and Brad Luther ’20, along with faculty member James Weiner, assistant professor of sport management, attended the Sport Marketing Association (SMA) annual conference Oct. 24-26 in Dallas, TX. The morning after the group’s competition, where they had performed strongly but didn’t advance to the finals, Weiner texted them to meet up for breakfast, thinking they’d be ready for a low-key day after weeks of nonstop preparation for the competition. Freiri, a sport management major of Los Gatos, CA, said they wanted to learn as much as they could to strengthen their own presentation for next year. It just made sense to do that, said Luther, a sport management major with a minor in marketing, of Palm City, FL. They are competitive and want to improve. The Case Study Bowl, presented by the Aspire Group, asks undergraduate students to apply the concepts learned in their sport management classes to solve real-world problems. The topic of this competition was on AT&T’s recent acquisition of the eSport company ESL. AT&T worked with SMA to create a case study focused on helping AT&T understand the eSport space and how to align ESL with the company’s entire portfolio. “This was a real problem that they had, and they gave our students a chance to try and tackle it,” said Weiner, noting that the panel of judges for the competition included executives from Complexity Gaming, one of the premier eSport organizations, sport marketing firm Wasserman, a vice president of AT&T and some of the premiere eSport researchers in the field. “Everything we've taught them in class — Dr. Margaret Tudor actually teaches them marketing — everything she's taught them about consumer behavior and branding and marketing, they're going to remember forever through this case study,” said Weiner. 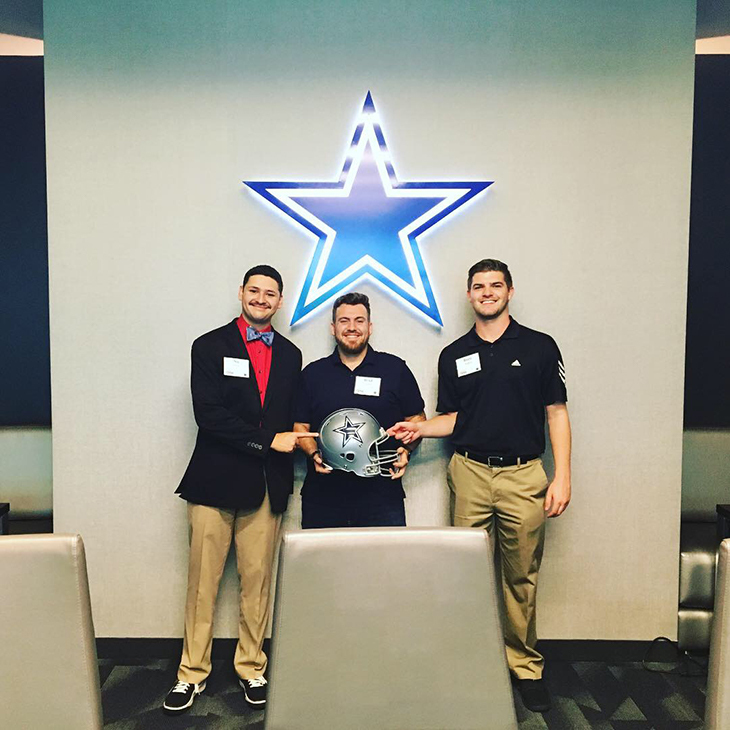 Freiri, Luther and Felton, who toured the Dallas Cowboys practice facility, were so impacted by the case study challenge that they plan to return next year to bring the trophy back to UT. It was UT’s first time in the SMA competition, competing against larger schools such as the University of North Carolina at Chapel Hill, Indiana State University, the University of Texas, the University of Massachusetts and Southern Methodist University, to name a few of the 13 schools represented, both nationally and internationally. Jason Simmons, former UT faculty member now at the University of Cincinnati, who is vice president of student affairs for the Sport Marketing Association, said the students represented UT well. The experience, including a tour of the Dallas Cowboys’ state-of-the-art practice facility, will leave imprints both academically and professionally. The plan is to compete in Chicago in next year’s SMA competition, but they also are considering how to start a sport management case study team as a student organization to be able to compete at multiple competitions throughout the year.